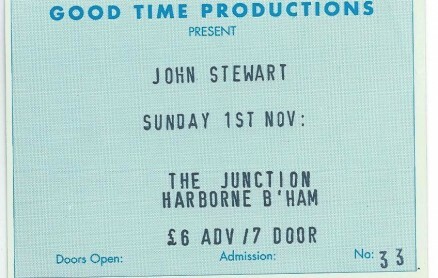 Ron Brinsdon has sent in this picture of a ticket stub of John Stewart playing at the Junction and these memories. For many of us who are nearer 60 than 50, three of the greatest music magazines from our own heydays were “Zig Zag” covering the heady and formative years of all of the influential UK and US artists and bands, “Dark Star” concentrating on the West Coast sound and “Omaha Rainbow” which was mainly dedicated to the late and great John Stewart. Go and see any pub band or soloist who plays “Daydream Believer” and, unless you are a bit of a muso, when asked who wrote DB you would probably say The Monkees when indeed it was Mr Stewart. 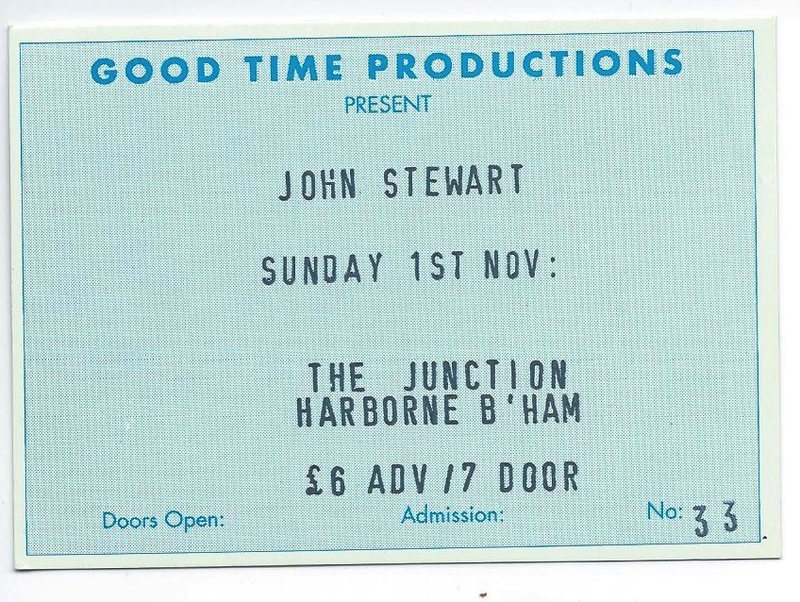 Memory of dates etc fades and I managed to see JS quite a few times throughout the UK including the original Robin but that Junction gig has to be in my all-time top ten of ANYONE I have ever seen. If you know the man’s work you will (hopefully) get my attachment to the gig, if you don’t, try and check him out. I know the gig was video taped but I have never seen a copy so many house-points will come your way if you could point me in the right direction! Saw Dr. John there in the 90s. Great night but couldn’t see much as guys like Steve Gibbons, Bev Bevan etc were all in the way. Well what a memory jerker, I was one of the promoters of Good Time Productions along with my wife Annette and our good friend Neil Kibbler. 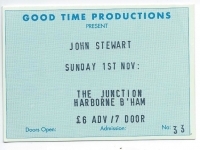 The John Stewart gig was one from the “American Songwriters Month” – Rory Block, Steve Young, David Halley . We were also at the Dr John gig put on by Jim Simpson! Josie Khun, Jimmie Dale Gilmore, Butch Hancock, Jessie Guitar Taylor, were also other gigs we promoted at The Junction. Great days………..
Ah yes, and Sid Griffin, The Rockingbirds, Peter Sarstedt, Tom Pacheco and Omar & The Howlers who sat and watched their road crew do their sound check for them!! Does anyone remember the upstairs room at the Junction in Harboure? I’m not sure of my dates but it would have been around 1976/77 some great but very local bands played there. I went chiefly to see Rudi and the Rationals who did wonderful Ramones covers.